RAPD (random amplified polymorphic DNA) analysis is wide used for the genetic mapping, taxonomic and phylogenetic studies of many organisms. It can be also applicable for the detection of DNA alterations after influence of many genotoxical agents as well . UV-radiation can produce several major types of DNA lesions such as cyclobutane-type pirimidine dimers and the 6-4 photoproducts . Another important types of DNA damages such as protein cross-links, DNA strand breaks, deletion or insertion of base pairs can also be induced by UV-irradiation. Whereas, irradiation by γ-rays leads to the increasing level of DNA break formation. These different types of DNA damages must be detected by changes in RAPD profiles. The aim of present study was to investigate the possibility mutation changes in plant DNA after the influence of UV-B and γ-ray with using RAPD method. The 10-mer primers with single nucleotide substitutions were used in order to estimate these structural alterations in DNA following after genotoxical agents' treatment. Approximately 0.20 g of plant tissue from alfalfa seedlings, which was irradiated by high doses of UV-B and γ – ray (LD50) was frozen in liquid nitrogen, ground with mortar and pestle and incubated in 1.5 ml of extraction buffer (100 mM Tris-HCl pH 8, 100 mM NaCl, 50 mM EDTA pH 8, 2% SDS and 0.1 mg/ml proteinase K) during 1.5 h at 37°C. DNA was extracted twice with chloroform:isoamyl alcohol (24:1) mixture. DNA was precipitated from the aqueous phase with 2 vol. of cold isopropanol at -20°C during 48 h. DNA pellet was harvested by centrifugation, washed several times in 70°ethanol, air-dried and dissolved in deionized water. RNAse treatment was performed accordingly to . DNA was analyzed using agarose gel electrophoresis. RAPD amplification involved initial denaturation of DNA template (20 ng per 25 μl reaction mix) at 94°C for 3 min, followed by 33 cycles of 1 min at 94°C, 1 min at 36°C and 2 min at 72°C in thermocycler "Tertsik" (Russia). Amplification was finished with incubation at 72°C for 7 min. The sequences of 10-mer primers (MedBioservice) with single base substitutions are given in Table 1. 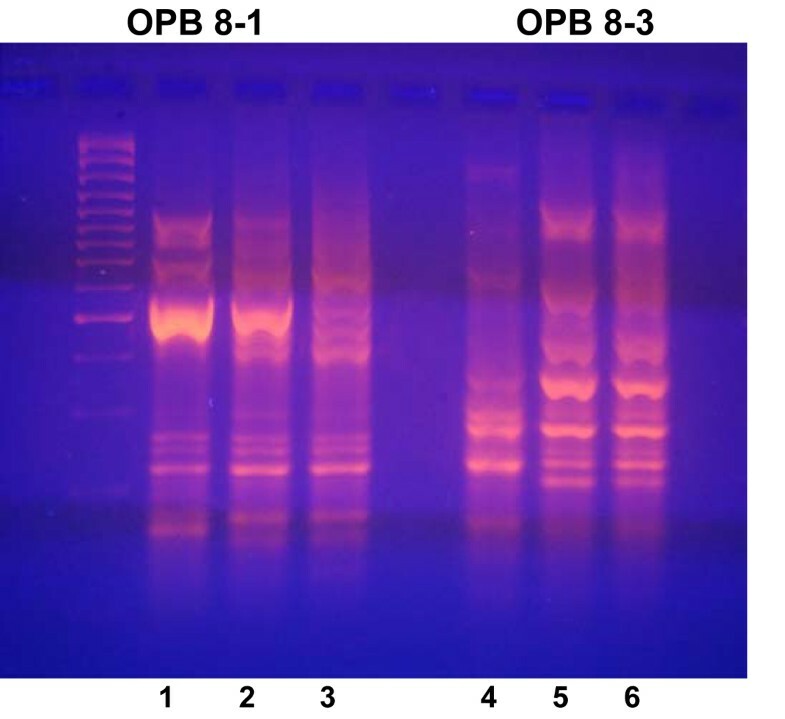 PCR amplification products were analyzed in 2.5 % (w/v) agarose gel in 0.5xTBE buffer. 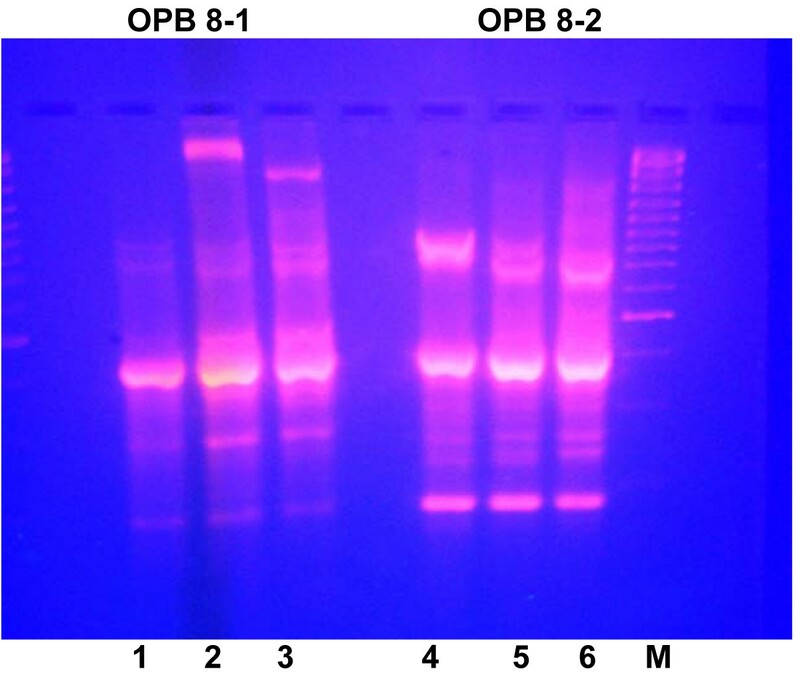 PCR products (25 μl per sample) were mixed with 3–5 μl Gel Loading Dye Solution (Fermentas, Lithvuania) and loaded onto the agarose gel, containing ethidium bromide (0.5 mkg/ml). Gene Ruler 100 bp DNA ladder was used for each agarose gel. Electrophoresis was carried out at 80 V for 3.5 h, then the results were visualized under UV light and documented using Canon digital camera. It was shown, that single nucleotide substitutions in 10-mer primers indeed can be reflected on the amplicons' profiles. The main changes observed in the RAPD profiles have been resulted both in an appearance (see Figure 1) or disappearance of different bands (see Figure 2) with variation of their intensity as well. These effects might be connected with structural rearrangements in DNA caused by different types of DNA damages. Thus, RFLP method is applicable for the detection of changes in the DNA structure after different genotoxical treatments. The variation in band intensity and disappearance of some bands may correlate with level of photoproducts in DNA template after genotoxical treatment, which can reduce the number of binding sites for Taq polymerase. Appearance of new bands can be explained as the result of different DNA structural changes (breaks, transpositions, deletions etc). We can estimate the existence of mutation and structural alterations in plant DNA after impact of different stressful factors on the bases of DNA patterns obtained after RAPD with the set of primers. Obviously, sensitivity of the RAPD assay depends of the mutations level and it needs further investigations.